An RV bathroom is normally fixed with a toilet, sink, tub and a shower. Under the soothing rush of water from an RV shower is what you will need to relax after a tough day behind the wheel. 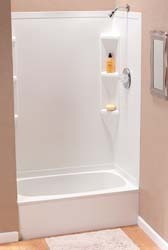 RV Showers come in many styles and designs.RV Shower Stalls by Lyons feature 6 shelves for maximum storage convenience. Lightly textured material allows for easy cleaning and helps prevent scuffs and scratches. No caulk or trim is necessary. These are available in White or Ivory, and in various widths from 32" to 40". Heights range from 56" to 62". Sides measure 24". Note: No caulk or trim is necessary. Three year warranty. Tub and Tub skirts not included.